Revers-a-Bomb is a 2-v.-2 minigame in Mario Party 4. It is also featured in the minigame compilation game, Mario Party: The Top 100. The camera zooms out while six Bob-ombs fall one by one. Players stand on either side of a large platform with six buttons on each side. Bob-ombs will walk toward either side. 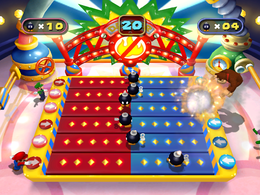 Players must press the buttons to divert the Bob-ombs to the other team's side. If a Bob-omb reaches the end of the platform, it will explode, stunning players if they happen to be at the spot where the Bob-omb exploded. The team that takes ten hits first loses. If time runs out before this happens, the team with the least amount of hits wins. Game Rules – "Press the corresponding buttons to redirect the Bob-ombs. Blow the other team up 10 times to win." Advice – "Explosions stop you from moving for a little while, so when those buttons light up, get to them quickly!" 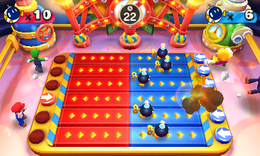 Description and on-screen – "Press the buttons to send Bob-ombs to your rivals!" Spanish ¡Esto es la Bob-omba! This is the Bob-omb! This page was last edited on August 4, 2018, at 10:08.